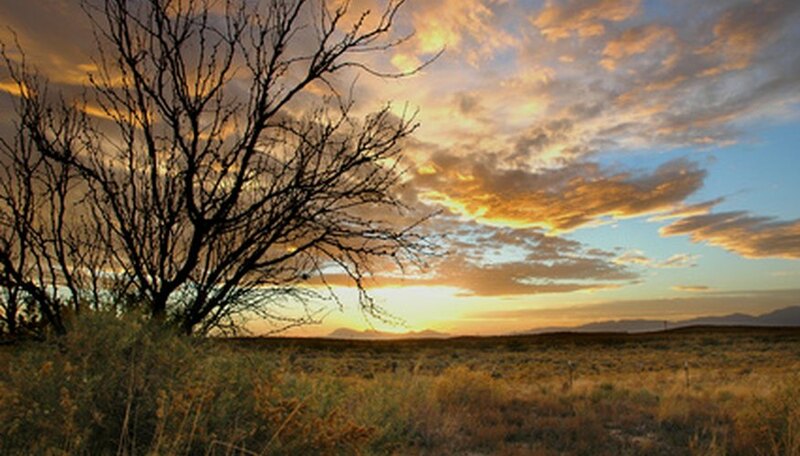 The high desert of southern New Mexico produces a distinct, cold winter season--perfect for many deciduous fruit and nut trees. Although intense summer sunlight, spring winds and generally alkaline soils prove troublesome, soil amendments and careful irrigation in a home garden mean many fruit trees are growing well in towns like Las Cruces, Roswell, Alamogordo and everyone's favorite, Truth or Consequences. All are in Sunset's climate zone 10. Long-lived trees that naturally tolerate alkaline soils, apricots flower early in spring, sometimes being nipped by late frosts. According to the New Mexico University Cooperative Extension service, fruit production occurs annually, but with full crops only about every fifth year. These pretty flowering trees act as welcoming small shade trees even if fruit production disappoints. Japanese plums remain susceptible to nutrient deficiencies in the state's alkaline soils. These trees bloom the same time as apricots, but tolerate late spring frosts better. All short-lived, choose Methley, Santa Rosa or Satsuma cultivars, or the hybrids Sepa or Gold. Avoid planting European plums in southern New Mexico. Expect no more than 10 years of life out of peach trees. Also weakened by the alkaline soils of the state, peaches tend to produce their largest fruit crops every five or six years. Winter sun-scald cracks the tree bark and can be diminished by painting trunks with exterior white latex paints. Choose later-spring flowering selections like Dixie Red, Raritan Rose and Redhaven. Both sweet and sour cherry trees grow acceptably in the mountains of southern New Mexico, and perform poorly in general at lower elevations. Meteor and North Star are two sour cherry cultivars that escape late spring frosts while flowering. A good choice for southern New Mexican orchards, pears produce well but must be monitored and sprayed to diminish problems with worms. Select varieties grown grafted onto dwarfing rootstocks. Bartlett, Duchess, Moonglow, and Eldorado gain recommendation from the University of New Mexico. For easier maintenance and earlier ripening of fruits, choose semi-dwarf or dwarf apple tree varieties. As with pears, monitor for worms on apples, and provide a garden setting with moist, fertile soils rich in organic matter. Fuji, Granny Smith and Mutsu perform well in the southern parts of the state, and Jonathan and Winesap in particular reddened nicely. Most newer commercial strains of apple varieties grow best in higher elevations. Avoid planting Rome all together.